One happy customer will tell a friend; but one unhappy customer will tell the world. Therefore, “satisfied customer” is realizing the ultimate dream along of the supply chain that can be driven by the strength of logistics, which is defined as the movement of materials and services along with the flow of information from the point of sourcing to the point of consumption. The sophisticated customers in modern information era are demanding for an effective and efficient flow of information along the supply chain. Therefore just like the every other aspect of the world, logistics too got the flavor of information and communication technology. It is the birth of the concept of e-logistics which is the application and service of web based technologies in logistics. In e-logistics the information flows to both directions of upstream and downstream fulfilling the needs of key role players in supply chain. Strengthening the information flow will result in integrating finance and material, the other major streams of supply chain. The major technologies of e-logistics are cargo tracking, online inquiry, online cargo booking, integration of information and customized information. It reduces the risk in the relationship between sellers, customer and intermediaries by ensuring that the right product in the right place at right time to the right customer in the global market. Not only that the reduction of wastage and the usage of resources in e-logistics align with lean and sustainable practices in supply chain. Even the elimination of many physical processes in logistic functions by e-logistics supports the flexibility and eliminates many barriers of gender equality in the world of work. The cost of logistics is about 22% of GDP (Gross Domestic Product) in Sri Lanka whereas in US it is about 8%. Today e-logistics is the backbone of managing logistics professionally and efficiently to enhance logistics-friendliness of a country which is a critical indication of positioning competitive in the global market. Currently few multinational organizations in Sri Lanka are operating e-logistics practices such as cargo tracking and ERP systems with their global influence in business. Moreover large and medium scale organizations in the island are implementing e-logistics in their supply chain models. But most of these implementations are done with limited resources, lack of computer literacy, language problems, cultural issues and without properly evaluating their capabilities and competence. These gaps should be addressed to lead Sri Lanka for a better tomorrow in e-logistics to the way forward. The statistics of ERP (Enterprise Resource Plan) vendors like SAP, ORACLE and PEOPLESOFT shows that the ERP adoption in Sri Lanka is less than 7% compared with the global adoption. Unfortunately majority of organizations are not motivated to invest in e-logistics partly because they doubt whether it will be an effective solution for a developing nation like Sri Lanka. But changes cannot be made without initiation. Organizations must eliminate traditional logistics and add the flavor of IT (Information Technology) to logistics to gain competitive advantage in local market as well as remain competitive globally. E-logistics addresses the enterprise needs by taking the process view to meet organizational goals through tight integration of all logistics functions within the enterprise. Today organizations are exposed to numerous modern technologies from small RFID to wider concepts of SAAS (Software As A Service). E-payment, information systems to check product availability, e-shipping, online insurance schemes to ensure safe product delivery, inventory management systems, vendor management, cargo tracking, computer based reverse logistics management systems, electronic data interchange and ERP will collaborate e-logistics techniques throughout the supply chain. IT application of 3PL (Third-party Logistics) operations will influence e-logistics in a wider range of organizations. Not only the private corporates, but also the government organizations largely involved in logistics like SLPA (Sri Lanka Ports Authority) and customs must think big to shift from their traditional frame. If they think big Sri Lanka will drive towards e-logistics the way forward. Just planting an e-logistic solution introduced in a different part of the world will not be effective for Sri Lanka and those applications must be adjusted in terms of organizational strategy, culture and human attitudes to fit in Sri Lankan context. Innovative and strategically thinking will create attractive e-logistics solution for organizations. Even the average person checks their mobile device 85 times a day which is also a critical investment opportunity of e-logistics. The social media which is heavily used to drive digital marketing is important e-logistics tool with a source of real time information. For example Maersk Line, the world’s largest container shipping company, uses different social media platforms such as Facebook, LinkedIn, Twitter and Instagram to engage with the various stakeholders and generates significant social capital for the business. Big data that reveals trends, patters, behaviors and IOT (Internet Of Things) emerged from wireless telecommunication are e-logistic applications. The temperature of a warehouse with inventory below room temperature can be controlled by IOT. More over RFID, sensors, EPOS (Electronic Point Of Sale), GPS (Global Positioning Systems) and verity of technology can be applied in e-logistics. Only the initiation and implementation in organizations will not drive Sri Lanka towards e-logistics the way forward. But also attracting Sri Lankan customers and winning their trust and reliance will make an effective evolution of e-logistics in the island. Internet enables e-logistics by bridging the customer and the organization from an interface of online information and services. But unfortunately the average internet penetration rate of Sri Lanka is 22% compared to 76.15% in the European Union. The cargo tracking, online inquiry, online cargo booking and customized information will be just a dream without internet access of customers. This is a result of social exclusion where the resources are not equally distributed around the island and the rural customers are isolated in underdeveloped infrastructure to access internet. For an example 60% of the e-commerce transactions in Sri Lanka are only carried out in three major cities of Colombo, Kandy and Galle. If affordable internet solutions are provided to rural areas along with training and user friendly e-logistics interface, most of the organizations will be able to approach untapped markets and encourage a broader customer base in e-logistics application. Even Amazon has strategically located fulfillment centers to provide internet access in rural India. Therefore addressing the disparity of resource distribution is critical in leading Sri Lanka towards the e-logistics. Since the e-logistics is profoundly impacted by the rise of mobile devices, it has made plenty of information available at fingertips of consumers while recording their behaviors, preferences and interests. Sri Lankans browsing via mobiles is higher compared to internet access as mobile penetration is at 107% and it is growing rapidly. Organizations investing on user friendly apps of mobile phones for cargo tracking, online inquiry and other logistics services will attract more customers to e-logistics industry. For an example a single app can be developed for any customer to approach any freight forwarding company in Sri Lanka and track his delivery rather than having separate cargo tracking services for distinct freight forwarding organizations. 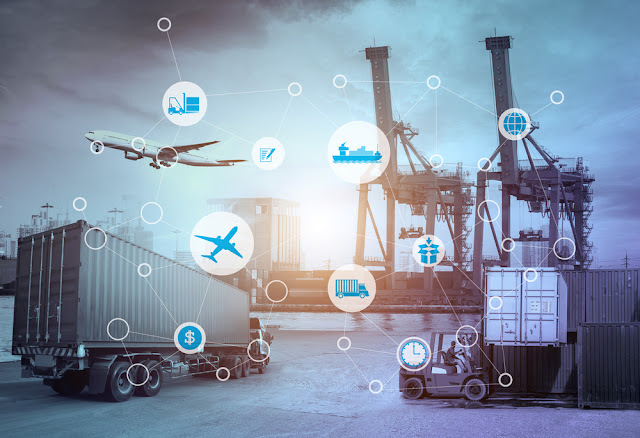 E-logistics is not a technology but a driver and an enabler that involves relational configurations, technological connectivity and process integration. It will drive towards digital supply chains to determine by business strategy while being agile and fast in order to sense and react quickly to customer demand. This will be the key to effective logistics which will drive in maximizing customer satisfaction. As once said by Michael LeBoeuf satisfied customer is the best business strategy ever which will guarantee in 100% customer retention, minimum lost sales and attracting new customers to the business. Therefore the chemistry of information technology and logistics will lead Sri Lanka towards e-logistics the way forward.